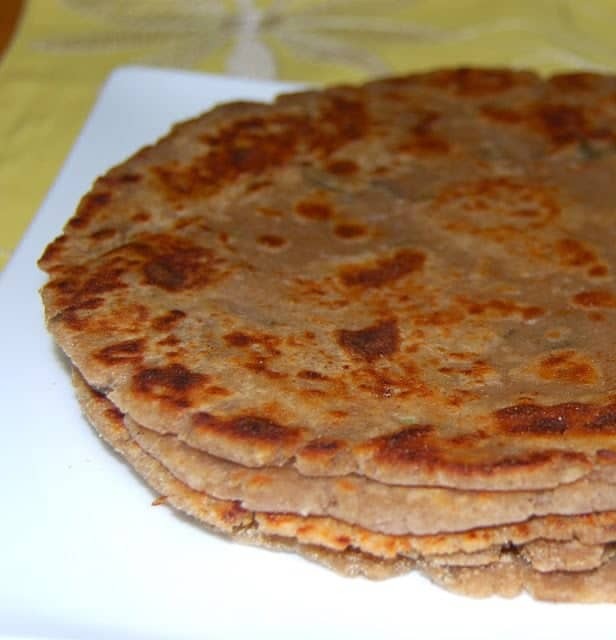 Delicious Tofu Paratha, made by encasing a spicy and flavorful mix of tofu and chickpea flour in whole wheat. Baking the tofu before you stuff it into the parathas makes it easier to handle and more flavorful, and the chickpea flour adds more protein and fiber to an already healthy dish. 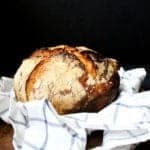 Vegan, nut-free recipe, free of added fats and oils. 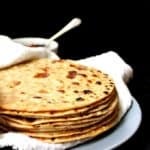 I wanted to update my Tofu Paratha recipe, posted almost 10 years ago when I first began this little food blog. 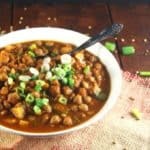 I’ve made many changes to the recipe since, all for the better, and this version is more flavorful, far easier, and even more healthful than it already was. 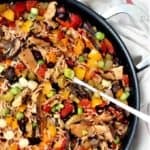 When I wrote that old post, I had just started incorporating tofu, which I didn’t much care for at the time, in my diet. 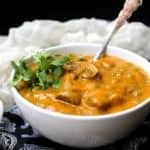 I have since found many more uses for tofu in Indian cuisine, most often to replace paneer, an Indian cheese, in recipes like Palak Paneer and Makhani, among many others. I also find that Jay has started eating it more easily, which helps, because in recent weeks, I’ve been trying to get him to eat an exclusively vegan diet. When Jay first came to us, he craved milk products and eggs, which he had been treated to only sometimes at the orphanage. With all the children in their care, they no doubt ran on a tight budget. At Desi’s insistence, we agreed to let Jay eat humanely sourced milk and eggs, at least for some time. A few weeks back, I realized that Jay no longer appeared enthusiastic about these foods, and it seemed like a good time to phase them out. I don’t think he misses them at all. 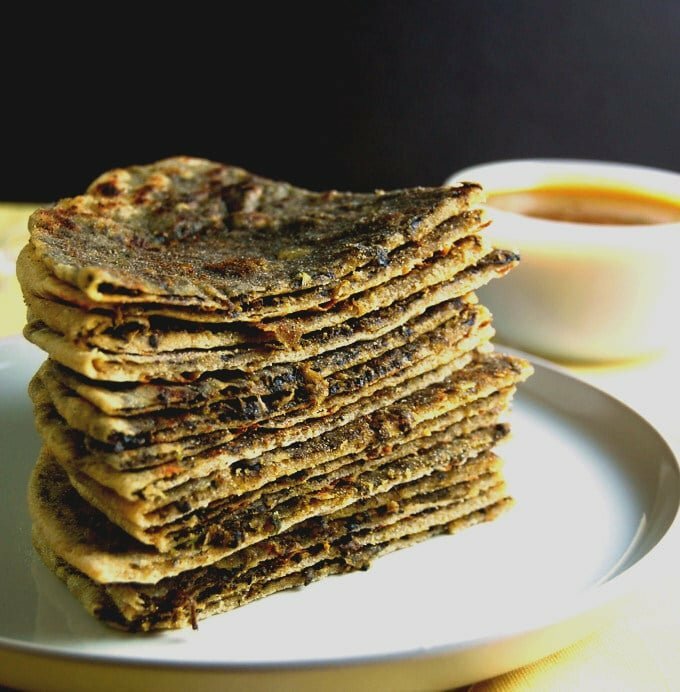 Of course, balancing his diet without these easy sources of protein is important, and while I am trying to no longer look at foods solely as nutrients, it does my heart happy to know that these parathas pack a protein punch. They are also delicious and free of any added fat. Jay can easily chow down four or five at a sitting. 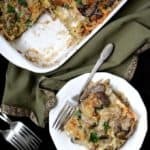 One of the complaints I had with the older version of this recipe — and which was echoed by some readers– is that the stuffing would sometimes tend to squeeze out of the parathas, because of the moisture in the tofu, even after it had been drained and squeezed. To deal with that problem, I decided to bake the tofu which removes most of the moisture and adds more flavor. It adds one more step to the process, but it’s an easy one, because all you do is slice the tofu and throw it in the oven. I usually do that the night before I make the parathas, to make the process easier the next day. I also add to the tofu some chickpea flour, which makes the Tofu Paratha healthier and tastier. 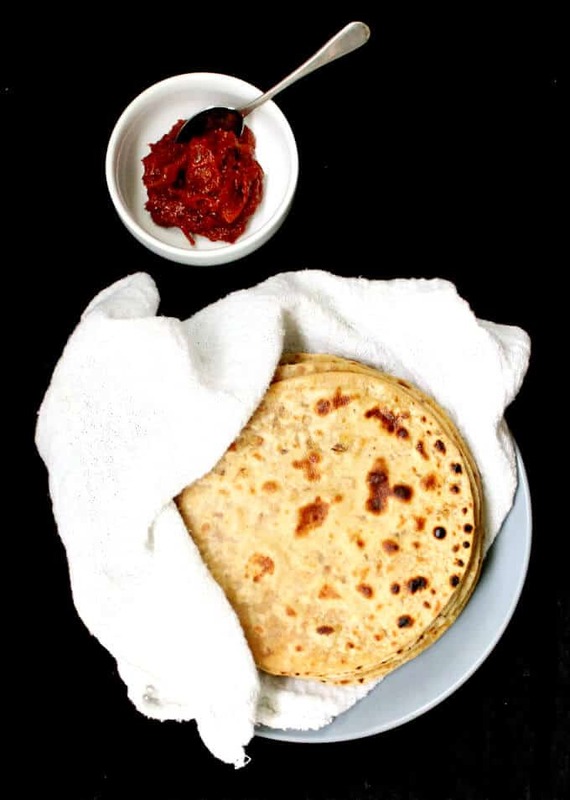 Once you have your ingredients prepped, these parathas come together smoothly and easily. You can even make the dough and the filling beforehand and prep your parathas right before eating. Perfect for busy moms and busy everyone. 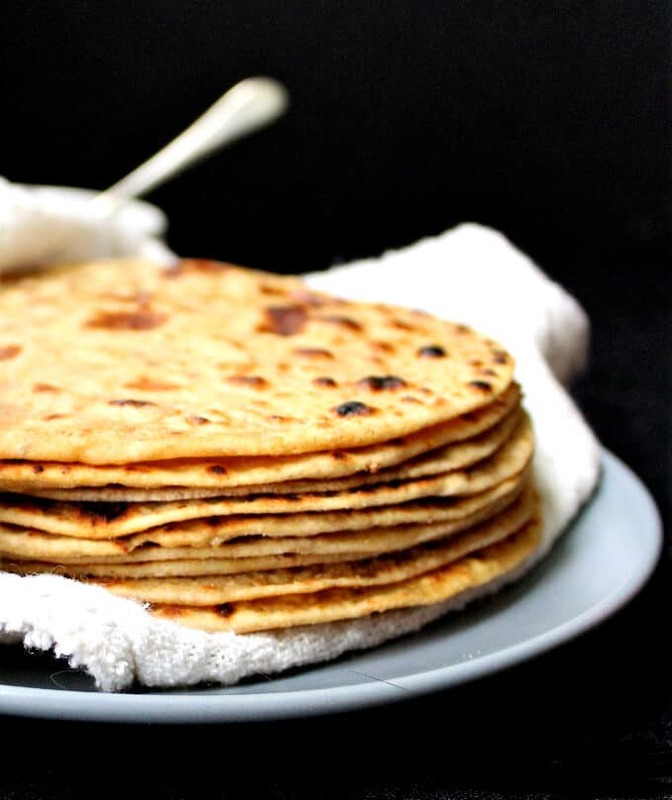 Delicious Tofu Parathas, made by encasing a spicy and flavorful mix of tofu and chickpea flour in whole wheat. Baking the tofu before you stuff it into the parathas makes it easier to handle and more flavorful, and the chickpea flour adds more protein and fiber to an already healthy dish. Vegan, nut-free recipe, free of added fats and oils. 1 14-oz block extra-firm tofu. Swaddle the tofu in paper towels and place in a colander with a heavy pan or weight on it, so most of the water drains out, about an hour. Slice the tofu into six pieces. Cover a baking sheet with tin foil and arrange the slices of tofu about an inch apart. 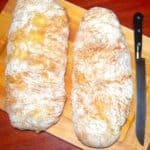 Bake in a preheated 400 degree oven for 30 minutes, flipping over once halfway. Set aside to cool. In a wok or a skillet, lightly roast the chickpea flour until it turns a couple of shades darker and smells fragrant. Set aside. Add the tofu and chickpea flour to the food processor with the remaining stuffing ingredients. Pulse until crumbly, with small bits of tofu. 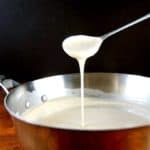 The mixture will look dry but should come together in a ball when shaped. 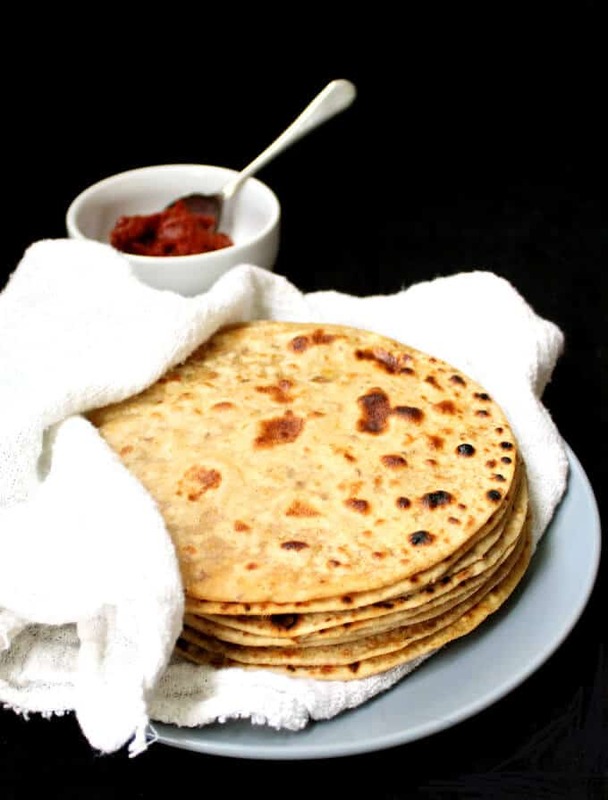 Knead the paratha ingredients into a smooth dough using enough water to yield a firm but pliable dough. Set aside for at least 15 minutes before making the parathas. Divide the dough into approximately 15 balls. On a lightly floured surface, roll each ball into a 3-inch disc. Place 1 heaping tablespoon of the stuffing in the center and gather up the sides, pinching off the top if you have too much excess dough. Roll out into a paratha about 5 inches in diameter. Flour the rolling pin and the paratha as needed. Heat a griddle and when hot but not smoking, place the paratha on it. Turn when small bubbles start to form. Cook on both sides until golden brown. You can make this without any added oil by using a nonstick pan or a well-seasoned cast iron pan, or spray lightly with cooking spray. 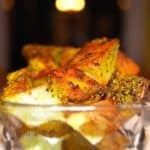 Serve piping hot with mint chutney or spicy Indian pickle. For even healthier variations, add some steamed and chopped spinach to the filling. 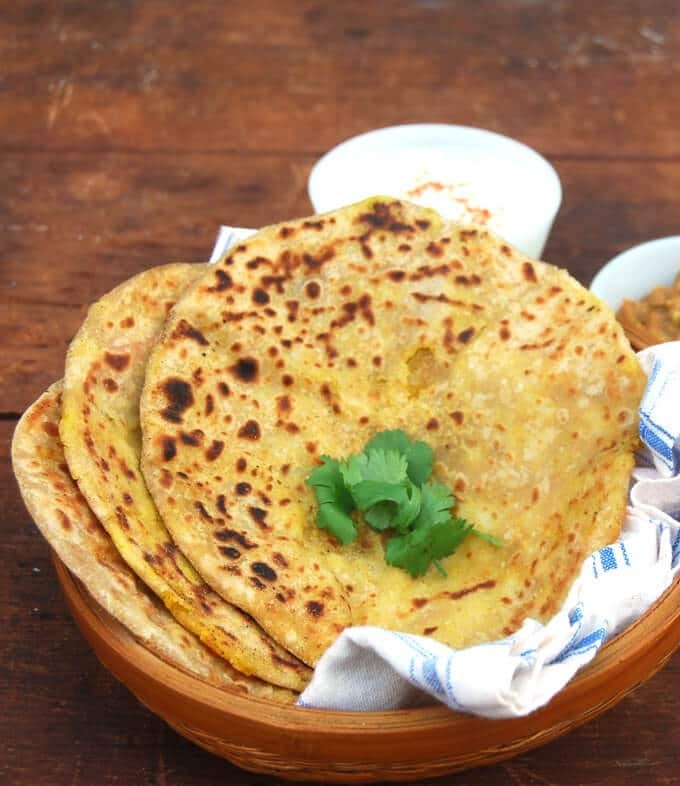 You can also add boiled, mashed potatoes, making this an aloo-tofu paratha. 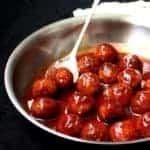 I am falling in love with this wonderful blog of urs…I think i will need lot more time to go thru each one of them and try them too…too much for a day i must say..hats off once again.. 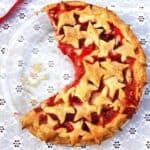 I wonder if I could make this gluten/free? You could try it with a gluten-free flour blend– should work.